St. Regis Butcher’s Block: It’s nice to meat you! Living abroad often presents situations, which back in your home country are simple mundane tasks. We have recently been challenged by: grocery shopping! It is not to say that in China we can’t find a grocery store, it is just that it is a bit harder to find your way around one when most things are written in a language you can’t read and many of the products are things you have never seen before. Locally we have a few options; the most convenient would be E Mart. It is walking distance and sells all the basics. However the quality of the fruit and veg has proven to be less than reliable there is very little in English. When shopping for something like meat being able to read the labels is very important. We tend to rely on E Mart for the simple basics like toilet paper, cleaning products and beer. Also locally we have Metro. This is a Costco-like store that sells local ingredients as well as many of the familiar English and American brands. We usually do a big shop here once or twice a month to stock up on things like Kerrygold Irish butter and Organic Valley Milk. We have even been known to pick up a bottle of HP Brown Sauce there. Besides these two options we have used an order and delivery service called Aaron’s Kitchen. It is a great company that provided quality western products that may be hard to find elsewhere as well as good quality meats. They require a week in advance for your order and that is where we have been getting our meats. We recently found ourselves with an empty freezer and as we could not place an Aaron’s Kitchen order (due to the Chinese New Year Holiday) we turned to Metro to get some chicken. The butchery was bare of any meat so a frozen whole chicken was the best we could come up with. 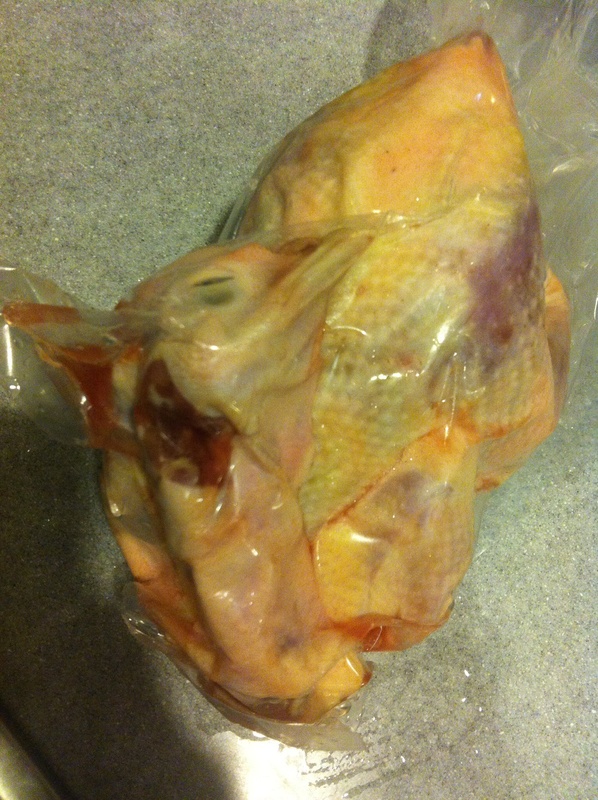 We were a bit surprised when we opened the packaging to find THE WHOLE CHICKEN, head, neck, feet and bum. For two teachers raised in suburban families this was something that was a bit out of both of our comfort zones. I enlisted in the help of my TA. 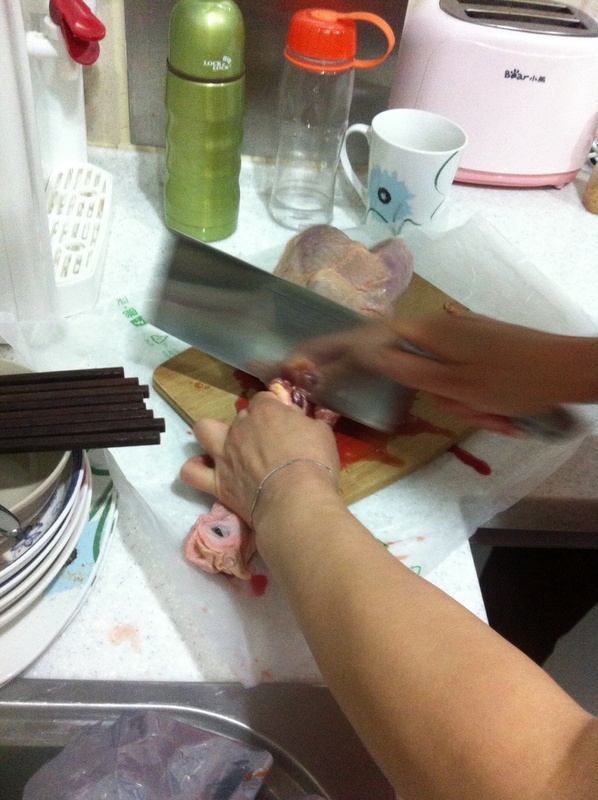 She laughed at my fright as she gracefully chopped off the head with blood gushing everywhere. Though the chicken was ready to roast the thought of his little eyes looking up at me over the beak was a too much to forget. 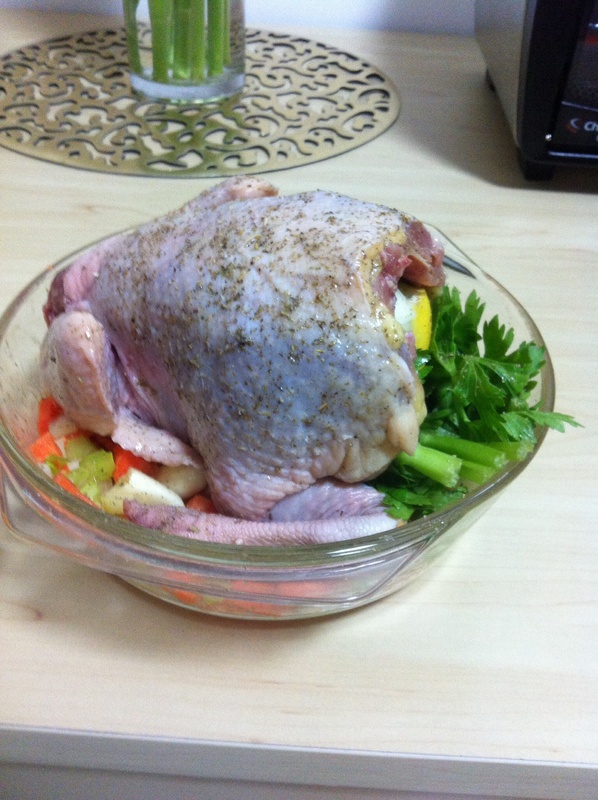 In the end the chicken served its purpose as I made a big pot of stock. At this point we were quite desperate to get some good quality meat so we could do some home cooking. Some of our co-workers had been using a service from the St. Regis Hotel – The Butchers Block, so we gave it a try. The order form was easy to read and use. We emailed our order on Wednesday and it was ready to collect on Saturday. The service at the hotel was fantastic, we were even given complimentary drinks whist we waited for our products. We couldn’t have been more pleased to see 7 chicken breasts, 7 English pork sausages, 1 kg of minced beef, beef brisket and a mixed grill of lamb, tenderloin, bacon, sausage and chicken. For 435 rmb (£43 or $71), it was expensive by Chinese standards but well worth it for the peace of mind it gave us. So glad we can be of help! Feel free to ask any questions. What is bringing you to Tianjin? Holy crap! I had no idea about this! I definitely need to try it! Also, in other news, we are having a gaming night at our place this Saturday and I swear my friends are probably cooler than I am, so if you guys want to join, it should be fun. A little dinner (tomato soup and grilled cheese–because why not) and cards against humanity. I don’t have your contact info, and my weChat ID is apparently impossible to find, so if you’re interested maybe send me an email with your weChat? Whatever…we can figure it out. Hi thanks for your comment and invite. We actually have a friends birthday on Saturday night and are heading down to Hotel Indigo for a few drinks. We will definitely catch up another time, in fact there is a comedy night at the Astor in March if you guys are interested? We will post details! Oooo–that sounds great! Keep me updated with the details!